For great sound on the go, you can't beat a boombox. This RipTunes model has a top-loading programmable CD player that's compatible with CD-R/ RW discs, an AM/FM tuner plus Bluetooth technology for streaming music from your smartphone or tablet. 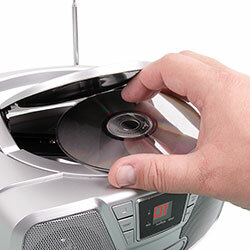 There's even an Aux jack for connecting your MP3 player and other portable devices. 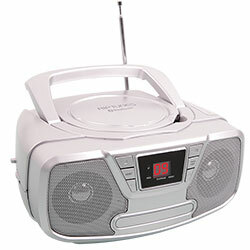 Also features twin speakers, LED display, telescoping antenna, carrying handle, AC/DC operation and more.